Druppotractus [sic.] irregularis Popofsky, 1912, Deutsche Tiefsee-Exped , vol 13, pp 114-115, text figs 24-26. An inner pear-shaped shell and outer ellipsoidal shell as in Druppatractus cf. pyriformis but with fewer and thinner three-bladed, radial beams joining them (10-15). 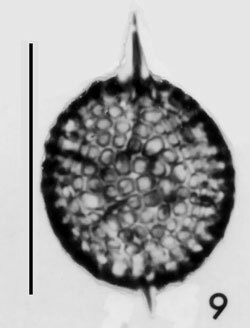 Two heavier polar beams generally coaxial with the major shell axis and each continuous with a polar spine; polar spines of unequal length but in contrast to Druppatractus cf. pyriformis the greater polar spine continuous with beam arising from pole opposite the one with the small lobe of the pear-shaped inner shell; lesser polar spine absent in many specimens; lesser polar spine, its associated beam, and the major axis of the inner shell (including the small lobe) displaced in many specimens as much as 30-40° from the major axis and coaxial greater polar spine of the outer shell; accessory spines continuous outward from the thinner radial beams generally absent, but 1-5 short, three-bladed spines present in a few specimens and generally located around one or the other pole of the major axis. Outer shell thin-walled, relatively smooth but generally with short thorns at the nodes of the intervening bars, with small, subequal, subregularly arranged polygonal to subpolygonal or subcircular pores, 12-18 (generally 15) on half the minor circumference, without polygonal frames. Inner shell with thin wall, smooth surface, with subequal, hexagonally arranged polygonal pores, 7-8 on half the minor circumference. Measurements; based on 30 specimens from stations 27, 34, and 71: major diameter of outer shell 69-92 µm, of inner shell 38-46 µm; minor diameter of outer shell 59-84 µm, of inner shell 30-34 µm; length of greater polar spine 4-33 µm, of lesser polar spine (when present) 6-22 µm, of accessory radial spines 2-21 µm. Remarks. The cortical shell of this species is much less variable in size and thickness of its wall than in Druppatractus cf. pyriformis. The presence of the pear-shaped medullary shell is a unique and constant feature in both species and was not observed in any other species from the Gulf. Distribution. This species is less abundant in the Gulf than D. cf. pyriformis. It is common to rare as far north as station 130 but is rare or absent farther north. It is absent at stations 133, 191, 203, 208, and 214. Its highest frequency was observed at stations 71 (4.4%) and 95 (4.0%) where at each it is the fifth most abundant species. It does not increase significantly in areas of upwelling; in fact, at station 90, it is very rare in contrast to the high frequency of the preceding species, but at station 91 it is almost common. Its greater frequency in the southern half of the Gulf and its decrease toward the north indicates its greater affinity for the tropical Pacific water masses than for those of higher temperature and salinity. Its distribution may also be controlled, in part, by upwelling, but the available data are too meager to make any conclusions regarding this. Popofsky (1912, p. 115) reported this species from the western tropical part of the Indian Ocean and from the tropical part of the central Atlantic Ocean. It, therefore, appears to be confined to the tropical parts of the world's oceans, unless the pear-shaped shell illustrated by Bailey (1856, Pl. 1, fig. 29) and reported from a high latitude is identical with this species, not with Druppatractus cf. pyriformis.